Double strollers are usually pricey, that’s why every parent want it to be durable and last for at least few years. Here I present you a stroller that will serve you for 4 or even 5 years – Baby Jogger City Mini GT Double. 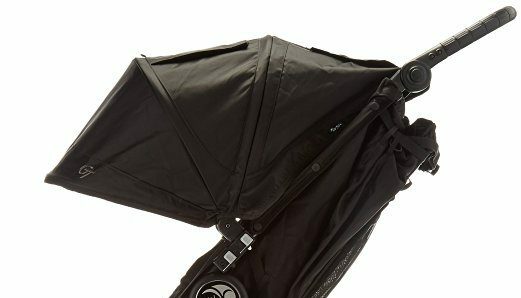 This is a perfect double stroller for every day strolls and running errands in the city jungle, and it also works amazing for off-road excursions. No matter if you are strolling over dirt trails or going over New York City streets, Baby Jogger City Mini GT Double won’t let you down. It’s multi-functional and comfortable for the babies. 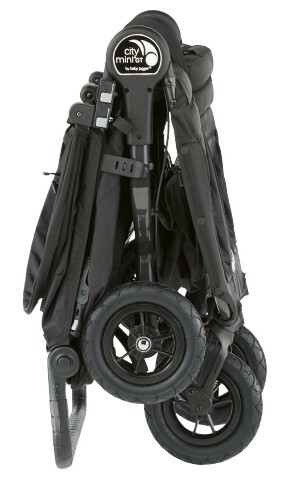 No wonder this is a very popular stroller and one of the best-selling double buggies in the US! 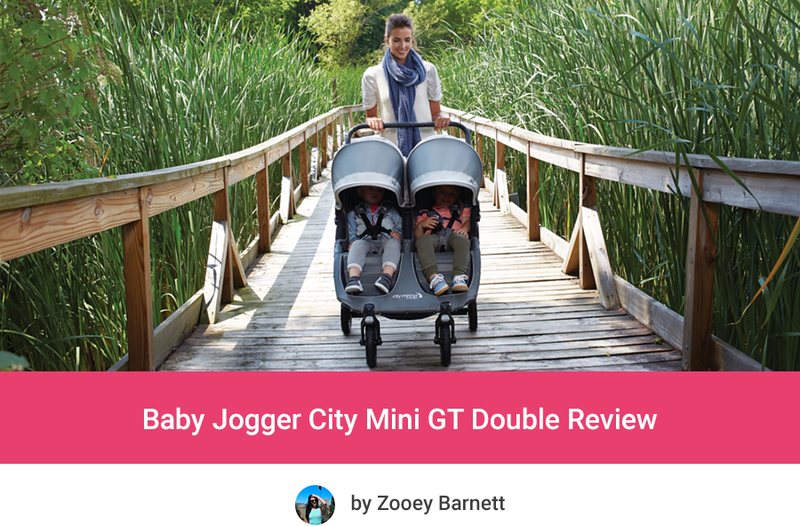 Baby Jogger City Mini GT Double 2016 – What are the improvements? What other parents think about City Mini GT Double? Let’s take a closer look at double City Mini GT features so you could find out if this is the right stroller for you and your children. City Mini GT Double has two seats padded with soft fabric which makes strolling very comfortable for the little passengers. There are also adjustable five-point harnesses for the babies safety. Each seat can accommodate passenger up to 50 lbs (total stroller capacity is 100 lbs). The seats are very roomy and have long back rests. 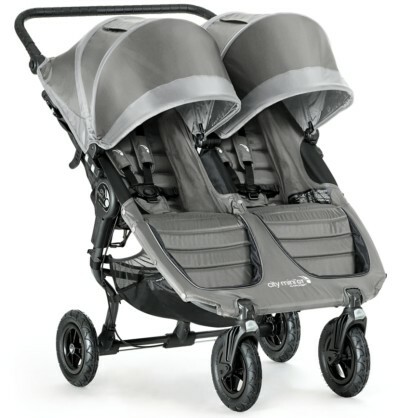 Maximum head height is 26”, which is more than many other double strollers offer. I’ve read many reviews of double City Mini GT and found out that some parents use it for 4 or 5-year-old children! So it can be also used as a stroller for big kids. The seat features multi-position recline with near-flat position. To recline the seat you need to use the strap with a buckle on the back. Keep in mind that the lowest position is not fully flat, therefore the seats are not suitable for newborns, only for babies with head and neck control (around 3-6 months). When the seats are fully reclined you can uncover a seat back vents for additional ventilation – useful especially during summer strolls. Seats recline individually so one child can ride in a near-flat position and the other one can sit upright and watch the surroundings. This is the infinite recline which means you stop it at whatever angle you want. You should remember that the most upright position is still few inches reclined. City Mini GT Double seats cannot be used for newborn babies, however Baby Jogger offers Compact Pram – bassinet that makes this stroller suitable for infants (from birth up to 6 months). 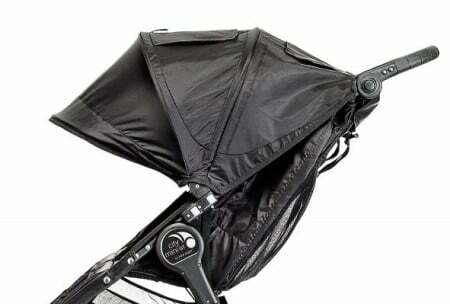 You can attach to the stroller one or two carrycots, depending on your needs. Compact Pram is sold separately. You can check the current price and see how it works with the stroller here. Double City Mini GT has all-terrain 8.5’’ rubber wheels, so this is an excellent stroller not only for running errands in the city, but it can also handle harsher surfaces. Front wheels swivel which gives better maneuverability and you can also lock them for greater stability (when you’re strolling over rough terrain). 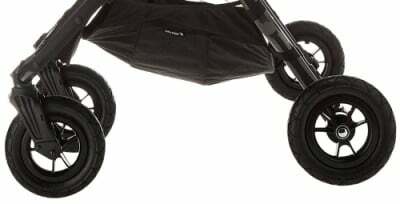 There is also a front wheel suspension which makes the stroll very comfortable for kids. Although the wheels are relatively small, this stroller can handle cracks, bumps and debris and your passengers won’t feel them! It also work well on grass, mulch, old bumpy sidewalks and cobblestone, a bit worse on gravel. Despite the name and wonderful wheels that can handle many types of terrain, this stroller is not meant to be a jogger and it is not safe for you and your babies to run with it. Keep in mind that Baby Jogger is the name of the brand, not the stroller type. This stroller has hand-operated parking brake, which is completely different than in most of other strollers. It’s not located on the handlebar, but below it (on the right side of the canopy) so it doesn’t get in the way when you’re pushing the stroller. Thanks to the handbrake you have the full control within reach and steering is very easy and convenient. City Mini GT Double has very nice adjustable sun shades with SPF50+ to protect your babies from harmful UV rays. Each canopy opens and closes individually so one of your passengers can nap while the other one is exploring the surroundings. You can pull the canopies pretty far down so there is no chance that sun will get into the children eyes. The canopies are really large and even cover babies legs! Each canopy has two peek-a-boo windows so you can check on your little ones during the trip.The only thing I don’t like about these canopies is the Velcro closure for peek-a-boo windows, it is so noisy. I wish it was a magnetic closure. There is an adjustable handlebar so parents of different heights can push the stroller with ease and comfort. Tall parents can rotate the handlebar to higher position to avoid wrist pain and hunching over the stroller. I like that this handlebar is not covered with foam, but the grip has rubberized rings – therefore it is more durable and it won’t tear during storing or transporting. However, I’d wish it was telescoping, not rotating, because it would give more space behind the stroller for parents with long legs. If you’re very tall and have longer legs you will be walking really close to the back of the stroller which sometimes may cause kicking it with feet. This stroller has pretty roomy storage basket, but unfortunately it is divided with a bar in the middle. That’s why although the basket is big, you can’t fit there even a medium-sized diaper bag. But you can fit there many items separately. It is definitely sufficient for babies essential (I didn’t mind taking only few diapers, snacks and sippy cups instead of whole diaper bag) or mom’s handbag. Because of this bar, the access to the basket is blocked and you cannot take full advantage of the storage space. In my opinion that’s the main flaw because the double City Mini GT 2016 is designed for running everyday errands and shopping! Nevertheless, there are two additional pockets on the back of the seats for your belongings like keys, phone, wallet etc. We can use the double City Mini GT 2016 from birth not only with bassinets, but there’s also an option of attaching one infant car seat. You can purchase City GO infant car seat, specially designed car seat compatible with it. Of course you can also use many other car seat brands, with special adapter for it. 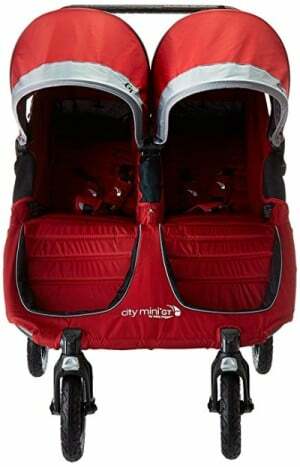 Visit BJ City Mini GT Double Amazon page to read more about the travel system option. I really like Baby Jogger City Mini GT Double 2016 for its versatility. Depending on your need, you can attach to the stroller one infant car seats and one or two bassinets. This is not the lightest stroller on the market, but it is not that bad when you consider it is a double pushchair which can be used on many types of terrain. It weighs 32.6 lbs and its dimensions are: 44″ x 29.75″ x 30-43.5″. However, for some parents it may be difficult to lift it to put in the car trunk, but it’s doable. It’s wide as every other side-by-side double stroller, but you won’t have any problems with getting through normal doorways. Nonetheless, it may be too bulky to fit through tight shopping aisles. Here starts the magic of the City Mini GT Double 2016. It has special, patented folding technology named fold™. When you want to fold the stroller you just need to pull the straps placed in the middle of the seats and the stroller will fold itself! I think it is one of the best (if not THE BEST) folding system I’ve ever used. If you have ever worried that a double stroller would be difficult to fold, you can forget about it with City Mini GT Double. It has an automatic lock to keep the stroller closed and compact for storage or transportation. 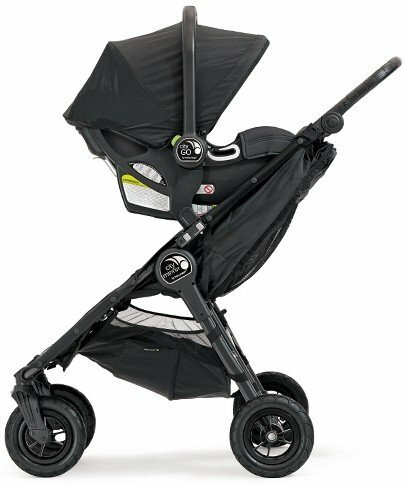 Dimensions of the folded Baby Jogger City Mini GT Double 2016 are: 12.5″ x 29.75″ x 31″. There’s only one drawback here – it doesn’t stand on its own. Double City Mini GT pushes very smoothly and it is super easy to steer. I’ve read dozens of reviews written by other parents and none of them have ever had any problems with pushing it with two passengers! 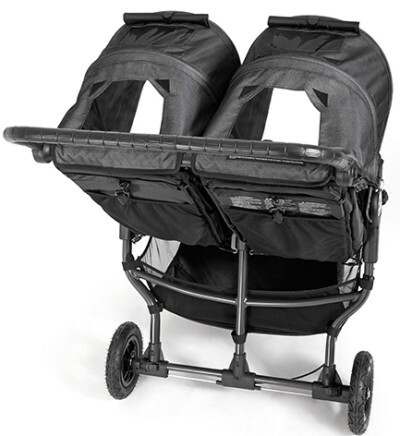 Many parents praise this double stroller for being easy to operate with one hand! Moreover, the seats and very comfortable for babies and the whole stroller has great ventilation with vented seat tops. 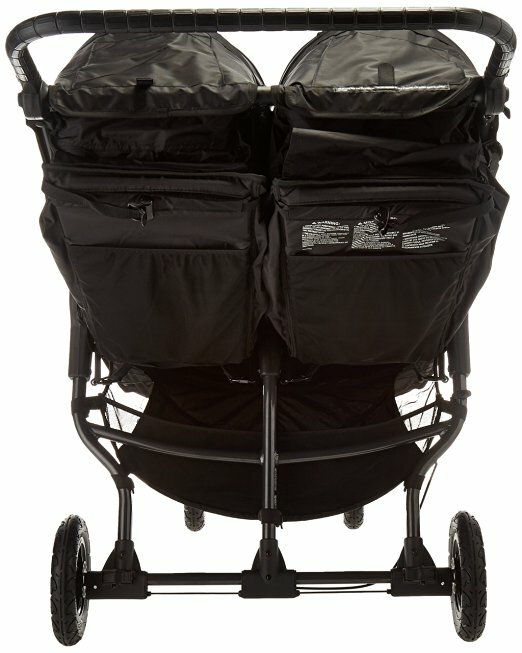 To sum up my City Mini GT Double Stroller Review I present you the major advantages and disadvantages. Baby Jogger City Mini GT Double 2016 is available in six color version: black, steel gray, black with gray, black with shadow, blue with gray and red with gray. The price may vary depending on the color you choose. You can check available color versions and compare the prices here. Compact Pram – you can attach to the stroller one or two bassinets to make it suitable for your newborn baby or twins. It can be used since birth till 6 months. The canopy and apron protect infant from sun and wind. Price: around $165-$175. Double Carry Bag – very useful accessory if you plan on traveling with City Mini GT Double Stroller, it can also simplify storage. Price ranges from around $90 to $100. Child Tray – perfect place for baby’s snacks and sippy cup. It’s very easy to install and clean. You can attach a tray to each seat. Price: around $20-$25. Parent Console – Great additional storage space which allows parent to keep their essentials at hand. There are two beverage holders and closed pouch for you phone or keys. Cup holders can double as storage pockets. Price: around $30-$35. The last model of City Mini GT Double is 2016. You may wonder what is the difference between this model of City and the previous version. Well, the 2016 version has improved handlebar and better automatic lock. There is a wider distance between rear wheels and greater distance between front wheels. The newest model is more stable and has different car seat adapters. The way we attach a car seat is also improved. And of course there are new color versions. I would recommend getting double City Mini GT 2016 model, because it has couple improvements and the price is almost the same as the older (and poorer) version. I checked this stroller on Amazon, as I always do. At the time I’m writing this, it has over 75 reviews, including over 60 positive ones. Parents praise its wheels, easy folding, sturdy construction, easy to adjust handlebar and convenient handbrake, near-flat recline and godd-sized canopy that provides nice shade. According to other customers it is easy to maneuver and push with one hand. Parents love that this stroller can accommodate taller kids and can be used also for older children (even 5-year-old). Among main disadvantages parents mention: it is heavy to put in and out of the car trunk and difficult to fit through narrow store aisles. Customers also complain about the storage basket. Want to read more reviews written by other parents? You can check what they say about City Mini GT Double on Amazon. Baby Jogger City Mini GT is designed for safety and stylish all-terrain cruising. It’s easy to operate with two kids in it, no matter if you’re running errands in the city or strolling in a park. 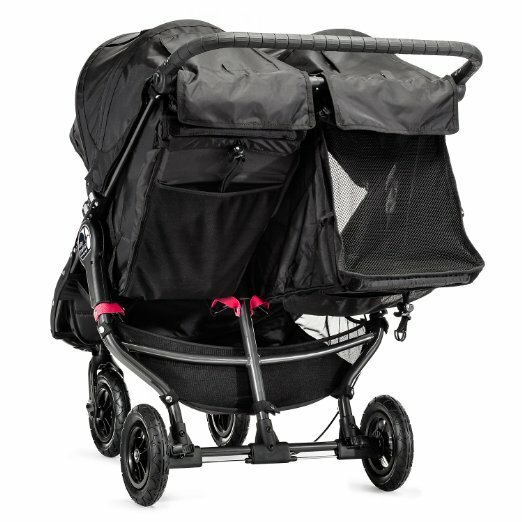 Remember that this stroller is not design for jogging (Baby Jogger is brand’s name, not the type of stroller). It is quite heavy and has rather useless storage basket. 1. 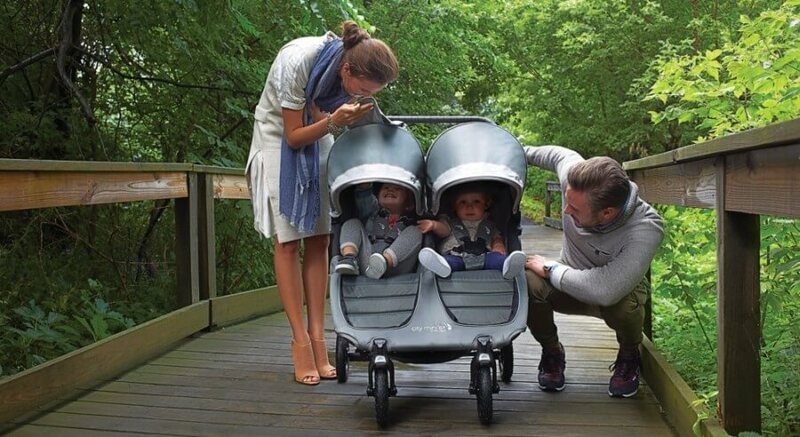 Thanks to great balance and weight distribution this stroller can serve not only for twins, but also kids of different age (for example newborn and 3-year-old). 2. This stroller is an investment for years. It’s not only durable, but it can also accommodate taller and older kids. It can serve you for many years, even when your kids get older and bigger. Many parents use it even for 5-year-old children! 3. It can handle different types of terrain really well. It’s made not only for strolling on sidewalks, but also for more rough surface. This is a great choice for urban parents who also like to go for an off-road walk once in a while. With this stroller, the terrain won’t limit you! Do you like Baby Jogger City Mini GT Double? Before you buy it, read what other parents who have this stroller, think about it and check currently available discounts on Amazon. Hi! Do you know the difference between the 2016 citi mini double gt and the newest anniversary edition 2018 citi mini double gt? Hi Emily! Have you seen City Mini GT Double in anniversary version? :) I’ve only seen the single model anniversary edition and the differences refer mainly to stroller look and included bumper bar. There is also a leather trim on the footrest and athleisure fabric on the seat (it’s softer than Nylon that you can find on the regular City Mini GT seat), padding is also more rich, a bit more comfortable and the harness has leather covers. I assume that double version of the stroller has similar upgrades 🙂 There are no differences in functions.